My friend laughed as we entered Docel Pastelaria in Lisbon the other day, and said that I could write about how we got there because of her serious need to go to the bathroom. “Well, that’s a good enough reason for me to visit somewhere new!” I smiled. Truth is, we didn’t go there just for convenience. Docel is one of her favorite places on Miguel Bombarda Av. where we were, and she wanted me to see it. As a Spotter, I know (and I’m sure you do too) that this is the best way to find out about new places! 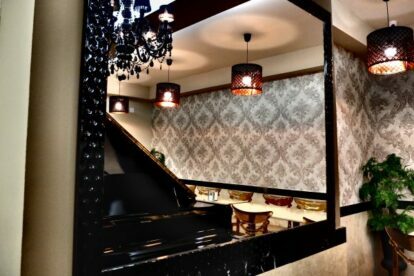 So there we went in this one-year-old elegant cafe with a treat: a grand piano, standing in the back, amongst retro-inspired wallpaper, mirrors, and black shiny chandeliers. The music selection was great; jazzy and inviting. The food was a temptation that you could not only see but also smell in the air. My friend’s favorites are the sweet miniatures (the cakes look delicious) but you can also have a yummy brunch for 15 euros, a veggie burger for 6.50 and other types of meals. Docel is a highlight in this area, and the best part is that it’s usually NOT crowded! So it is a great spot to relax privately with one or two friends, or even do some work or study. And of course, it’s a great pit stop for travelers! P.S. : It’s very near Jardins da Gulbenkian, another spot you really shouldn’t miss if you’re in Lisbon.